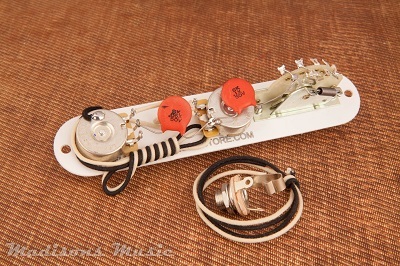 Madison's 1960's Telecaster 'DARK CIRCUIT' wiring harness. Reproduction .05 and .1 Ceramic Capacitors. Our harnesses are wired using CTS 250k Solid shaft potentiomenters, CRL Switches and Switchcraft input jacks. These are assembled with precision and sure to please. This is a great way to enhance your tone using one of Madison's reproduction tone capacitors.